Deciding to start this blog coincidentally timed perfectly with my first trip to Paris. Mr. R has been working hard lately and needed a break and who was I to turn down the suggestion that we go to Paris for a week? I mean, it’s a city full of pastry geniuses that I’ve only read about but never had the chance to experience. The Louvre, Eiffel Tower, and Versailles? Merely distractions necessary to build up an appetite for more delicious pursuits. Laduree, Pierre Herme, Jacques Genin; eclairs, macarons, gateaux, sables…before I knew it the list of things to try was getting overwhelming. How could we do everything in just one week, especially since we were leaving the city for a couple days to go to Burgundy? That evanescent quality of a good macaron perfectly describes the whole trip. Paris is a city to be experienced and enjoyed in the moment. So many sights to see and foods to try in a city that seemed filled with perpetual activity everywhere we went despite the persistent rain that according to locals has plagued the city since May. Unlike the pounds (literally…) of biscotti brought back from our honeymoon in Italy, or the durable honey-laden lebkuchen from the Christmas market in Nüremberg last winter; the butter and cream-laden pastries of Paris don’t last. A good baguette is said to have a life-span of merely six hours, and a box of macarons will keep 4 days only if promptly refrigerated after purchase (though they’re really only the best on the day you get them, and please don’t put them in a fridge that smells like French cheese!). So here I am, back in Madison with some tins of butter cookies, a few chocolates that I refuse to eat until my cold goes away so I can fully appreciate their mastery, and a lot of pictures, feeling like all of Paris had to be left behind and wondering when I will be back again for seconds. Happily, I did manage to bring back one thing with a more lasting quality: a slew of new ideas and recipes I’m eager to start trying in my own kitchen. (I even brought back a french cookbook, thank goodness for google translate!) There are too many things to share in just one post, so for now I hope to whet your anticipation for more Paris inspired posts to come with a couple of my favorite pastries of the trip. 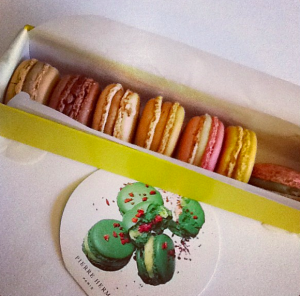 You can’t visit Paris and not try macarons. They are more pervasive in Paris than cupcakes in New York, but I think their popularity is more justified. I’ve read that Laduree’s macarons are all made by machine now while Pierre Herme macs remain handmade, but Mr. R and I both agreed that we liked Laduree more. Pierre Herme is more daring and inventive with his flavors; but he’s also more heavy handed with the buttercream, making his macarons more substantial with less of the fleeting quality of macarons I find so alluring. Standout flavors were Pierre Herme’s praline and vanilla (how does he make vanilla taste so intensely vanilla-y?!) and Laduree’s blood orange ginger. I was really excited about the pitch black licorice one, but it was sadly only in name not flavor. My last macaron of the trip was a coffee flavored one from Angelina, which made me wish in vain that a box of them could survive the 8 hr plane ride and 3 hr drive back to Madison to be safely squirreled away in my freezer. My favorite pastry of the trip came from a bakery named Vandermeersch on the outskirts of the city. Since they are only made on weekends and rumored to sell out before noon, we trekked out there on the Paris metro on Sunday morning (I swear this is how Parisians stay fit, an endless maze of stairs!) to get ourselves the yeasted Alsatian cake soaked in orange water syrup and dredged in sugar called Kouglof. Emerging from the metro, we sinkingly realized our empty stomachs and pre-caffeine morning daze had caused a rather unfortunate miscommunication about who had the address; but we thankfully found the place before breaking down and eating sub-par pastries at the nearest cafe in sight. At 10 am there was a line out the door giving us time to chat with a woman who was surprised that a couple foreigners had heard about her neighborhood bakery and ventured to deviate from the normal tourist routine. Finally inside, Mr. R ordered an almond croissant and I picked out a mini kouglof, a palmier, and a little puff of pate a choux dough covered in sugar pearls (future post to come for sure! And how is it that Mr. R always makes me feel like a pastry lush?). I hate to admit we were so hungry there was no thought to photograph the little cake* we had gone to so much trouble for, but oh was it worth the trouble!!! So beautifully light and fluffy! perfectly moist! It was studded with sweet golden raisins that had none of the chewy, fibrous texture of raisins, and wholly infused with an alluringly delicate orange flavor that compelled me to keep eating! I finally distracted myself from the Kouglof long enough to break off a flaky corner of the palmier that instantly and totally changed my understanding of this humble looking cookie. Palmiers as I knew them pre-Paris were dry and flaky, tasting mostly of plain sugar; but the palmier at Vandermeersch was rich with decadently luscious and salty butter, and the outer layers had become caramelized and nutty during baking. I’m afraid it probably ruined my ability to enjoy palmiers outside of France for a very long time. I could keep gushing about all the amazing things we tried in Paris, but I feel like this post has already gotten too long. So I’ll stop for now, hoping this post made you hungry enough that you’re searching for a snack! *Cake is not quite the appropriate name for this treat. The yeast gives it a light and airy texture more like a bread than the denser crumb of a cake, yet the copious amounts of butter and sugar surely in the recipe mean that I cannot call it something that does not imply its rich and decadent qualities. 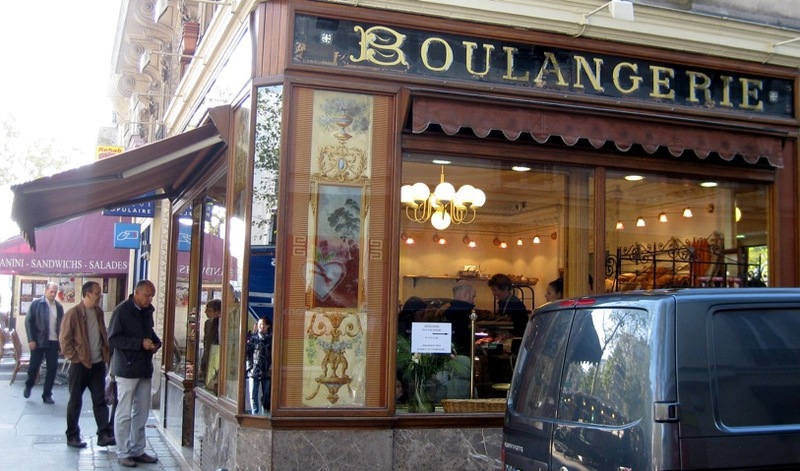 2 Responses to "Buttery, Bustling, Ephemeral Paris"
This did, indeed, make me hungry. 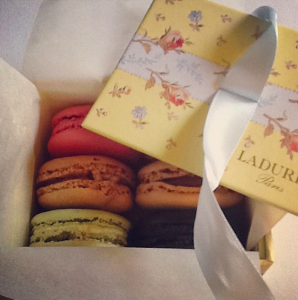 I wish I actually liked macarons. You make them sound so amazing, but something about the texture is just off putting to me. more for everyone else that way, though!